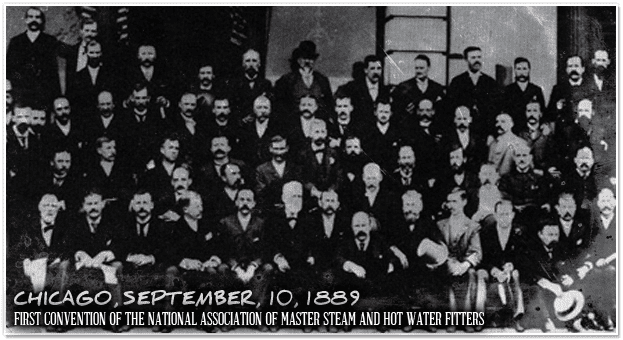 In 1888 a group of progressive steam and hot water heating contractors formed the Master Steam Fitters of Chicago, with goals of keeping standards high in the industry and improving the reputation of steam fitting contractors. In 1892 the group negotiated the first Steam Fitters Agreement between the Contractors Association of Chicago and the Journeyman’s Association of Chicago – the predecessor to Local 597, the largest pipe fitter local in the United States. It was the first of many agreements that resulted in over a century without a work stoppage. A giant stride toward labor peace among all of the trades was accomplished in 1913 when the Association co-founded the Joint Conference Board (JCB). The Board was set up “to prevent strikes and lockouts, and to facilitate peaceful adjustment of jurisdiction disputes in the building and construction industry.” The next decade saw the development of the first steam pipe fitting standards, as well as the beginning of modern technology in steam and hot water heating systems. Certified Heating Standards were introduced to Chicago owners, architects, engineers, contractors and the nation by the Association in the 1920’s. This feat was followed by Certified Refrigeration Standards in the 1930s, Certified Air Conditioning Standards in the 1940s and Certified Gas Equipment Installation Standards in the 1950s. The 1940s marked the birth of the Certified Welding Bureau, the forerunner of the National Certified Pipe Welding Bureau. In the 1960s, MCA was instrumental in the formation of Construction Industry Affairs Committee (CIAC). The Committee came about because the taller, more complex structures being built required more cooperation among the building trades than ever before. Since the 1960s, MCA has been active in issues such as the Chicago Plan for Separate Bids, as well as its work for the Piping Education Council. The Association spearheaded the rollback of sales taxes on construction and played a role in the fight to repeal the Scaffold Act in Illinois. While always at the forefront of worker safety education, MCA is equally committed to the effort for workers’ compensation reform. No matter what the Association tackles, its purpose has never wavered: MCA helps members meet the challenging demands of doing business every day.